The Department of Nursing offers an amazing experience to the senior nursing students to be able to apply to the Alaska Public Health Clinical. Up to 6 nursing seniors will be admitted to the program; students submit applications which are reviewed by Nursing Staff from Gustavus and the Alaskan program Staff who ultimately decide which six students exemplify qualities necessary for participation in this extraordinary opportunity in Alaska. Jessica Dirks was one of the five students that had the opportunity to travel to Alaska Fall of 2018. She is a senior nursing student from Le Suer Minnesota. 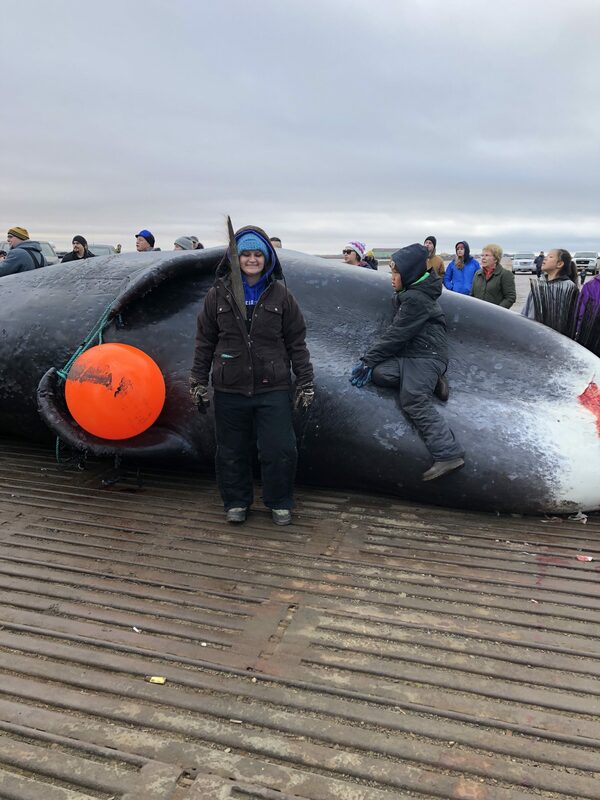 In the picture you will be able to see Jessica standing next to a whale that was pulled ashore by the Inupiat Whaling captains and their crews. With her interests in fishing, helping the Inupiat captains capture this whale must have been extremely interesting for her; the time taken to carve the whale lasting longer than three hours. After the carving process was finished, out of gratitude for her help, Jess was given a good portion of the meat which she donated to the Ilisagvik College where her and the rest of the Gustavus group was staying. Jessica Dirks ’19 Standing Next to a Whale. This course will provide students with an opportunity to explore the history, culture, and modern day challenges of Alaskan Native/Native Americans. Particular attention will be given to the tension between traditional worldview/ practices and western worldview/practices. Leininger’s Transcultural Theory and Culbertson’s Iceberg Theory of Education will be used in gathering narrative accounts on essential values of Alaska Natives/ Native Americans through numerous readings and intentional dialogue with members of Alaska Native/ Native Americans. This course is not required for the Nursing Major, but may be taken as an elective.